When my son was little, we were rarely home during the day. I always had us somewhere; playgroups, meals out, rides in the car so that he would nap and I could drive through a Dunkin Donuts as well as just about anywhere a stroller was welcome. Being out with a baby/toddler though isn’t all that simple. I can recall so many moments where all I wanted was to return to what I referred to as my Home Base. Home Base = My house, my safe haven fully stocked with diapers and wipes, extra clothes for when he made a mess, a changing table within reach, a playpen to stick him in and a coffee machine waiting to brew. You know, your comfort zone. Even if you don’t have kids, don’t you sometimes just want to go home and hide under the covers, where you feel safe? I thought about this yesterday as I battled the treadmill. That’s right – all my preaching about my love for the machine has come to a screeching halt. Some days I do feel like a track star on that machine. Endorphins will do that to you, you know. I didn’t want to run on the treadmill yesterday though. Not at all. 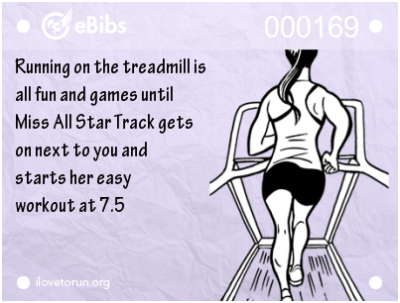 My treadmill runs are always speedy runs and what I really needed was an easy run. To be honest, I really struggle on the treadmill when it comes to just running at my easy pace, safe pace or, as I sometimes refer to it, that sweet spot where I just run to run, running where I am comfortable – at my Home Pace. Anyway, what was I saying? Oh right, home pace. Do you know your home pace? I have come to realize it is an important thing to figure out. Over the course of the last few weeks, I have decided that home pace for me is around 6.8 (8:49 min/mile). Just under 9:00 min/mile is comfortable yet keeps me working just a bit. It is much easier for me to go for an easy run when I am outside but yesterday I tried very hard to achieve this type of run indoors. Not every run can be a challenging, speed work, interval or tempo run. And if you think it can be, your body will notify you otherwise, either in the form of burnout, injury or if you are like me this week, FEROCIOUS HUNGER. You should know that for several days now, I am just hungry. The kind of hungry where you finish your plate and wonder who stole your dinner because you clearly didn’t eat it – if you did you would feel slightly full and you don’t. While I have no photos of the multiple meals I have consumed (who can think about taking pictures when they are starving? 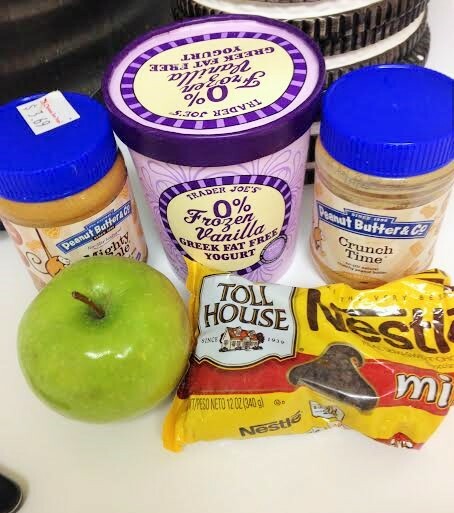 ), I did promise you my new twist on an apple and peanut butter. You may decide to stay in for dessert this weekend instead of hitting up your local frozen yogurt store. Seriously. This combo is so good that I skipped going out for dessert a few nights ago in favor of staying in and making this. 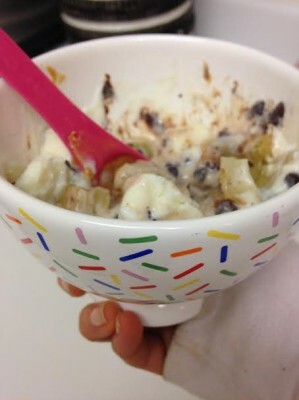 It may not photograph pretty but at least my sprinkle bowl is appealing. Warmed apples topped with peanut butter and vanilla greek frozen yogurt covered in mini chocolate chips. The ingredients are so simple, so basic and we can even consider them healthy. Dice apples and microwave for about 90 seconds. 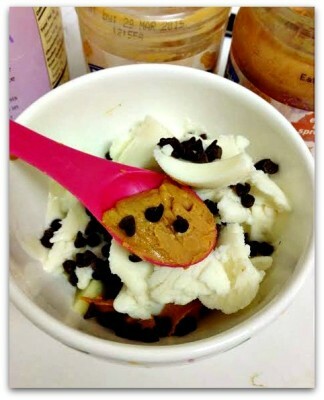 Top with peanut butter followed by yogurt. Add chocolate chips on top. Then mix it all up. The warm apples mesh with the cold yogurt and the peanut butter gets involved and creates major flavor. The chocolate chips get melty but not too melty because you put them on top leaving you with the right amount of chippy crunch. 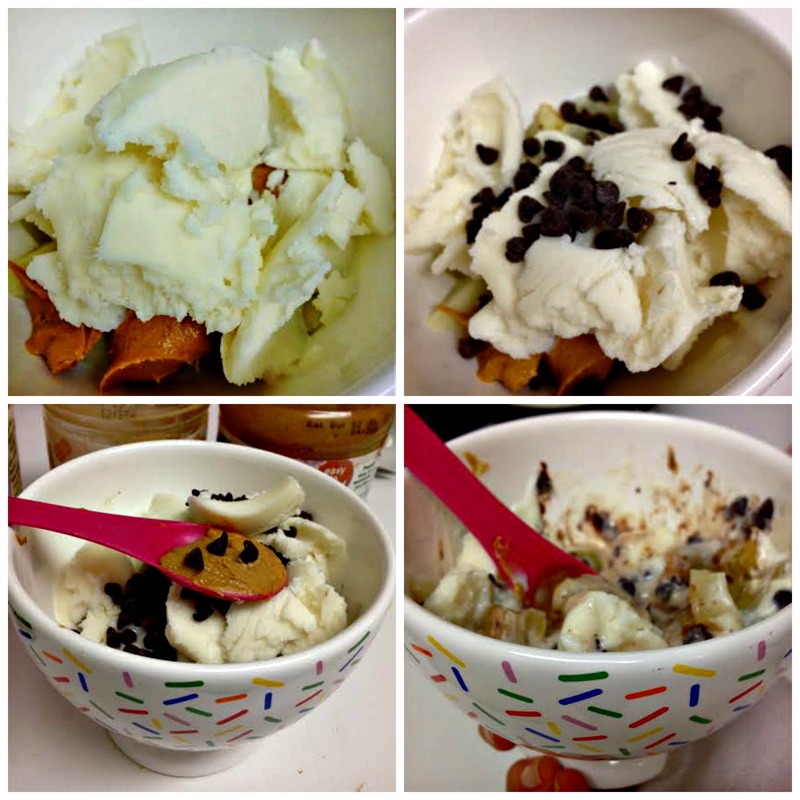 You can really use any frozen yogurt you have on hand but I think the greek frozen yogurt adds a tartness and combines flavors really well with the warmed apple. If you don’t have a Trader Joe’s to get this specific yogurt, I know Stonyfield makes a frozen greek which is available in most grocery stores. I bet the grocery stores will be packed between now and Sunday though for the Super Bowl snack and ingredient haul. If you are wondering what I will be making, the answer is nothing. Sometimes one deserves a break from the kitchen. Although if anyone wants an apple bowl, I am pretty sure I can provide that. Are you hosting a Super Bowl party? 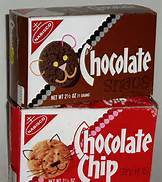 Favorite cookie from when you were little? Do you know your Home Pace for an easy, comfortable run? My favorite cookie growing up was those cheap oatmeal ones with frosting. I have no idea why. I think we all have off days on the treadmill. I love speed workouts but just like you, when I had to run easy, I couldn’t stand it. My favorite cookies growing up was ginger snaps. I loved dunking them in a nice cold glass of milk. See I’m the opposite of you on the treadmill. Whenever I step on one the slow side of me comes out. I think I’m so distracted by the tv’s or the guy beside me doing presses on his treadmill. I have the EXACT same problem with the treadmill. For some reason I just cannot go on it unless I am doing an intense workout…I just feel a need for speed and hate pushing my speed below a certain number lol. When I’m outside, I can just run blissfully and peacefully without timing myself or caring, which is why I prefer it! I am able to workout by feeling instead of worrying about my time. The good thing about being a fast runner is that nobody ever bothers to go next to me to distract me from my workouts. Literally, people will get on a treadmill next to me, look at me run, and then move. At first I just thought it was a fluke, but it happens almost every time I workout hahaha. Especially guys…they won’t ever run next to me. EVER! You too – good luck and mazel tov on the move! you could be a great author. I will make sure to bookmark your blog and will often come back in the foreseeable future.